So the History channel is doing a Jousting Competition. I emailed the warhorse folks who have Kahlua and told them and they already knew about it, and said the jousting community heard first. They didn't say if anyone from their group was going to try to compete. Considering how good looking AND qualified some of their knights are, I'd imagine they'd have a good shot! Congratulations to New York! One more step in the right direction, even if it's slow going, yes? 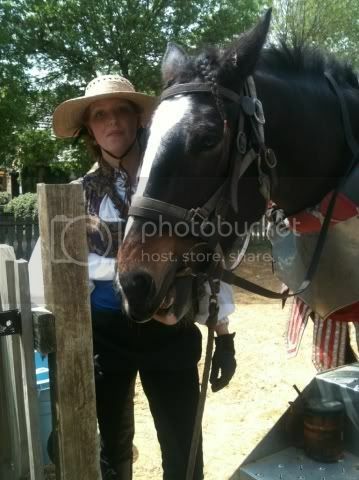 Also if any New York people feel a yen for a Renaissance Fair, the troop who have Kahlua are there right now, so if you go see the jousters, and see a big bay shire girl doing pony rides, that's my girl. :) Here she is from a few weeks ago . . . with her mane clearly not grown back in from where she rubbed it off.